Time to tackle Marcus Aurelius’ Meditations, arguably the most read Stoic classic of them all. As is well known, it was written as a personal diary by the Roman emperor, and hence not meant for publication. This accounts for the odd structure, as well as the (apparently, but not really, since he was talking to himself) “preachy” style. I read it years ago, but given my novel interest in Stoicism, I figured I should start it again from scratch, taking notes of what I find particularly interesting. This post will deal only with Book I. Hopefully I will be able to write a short entry for each of the 12 books. 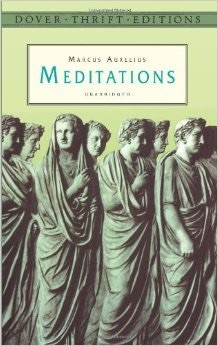 Speaking of unusual style, the first book of the Meditations is essentially a list of people Marcus is grateful to, each accompanied by an explanation of what he is grateful to them for. It is, of course, an instructive list. Next comes his mother, credited for his abstinence from evil deeds and even thoughts, as well as for the practice of a simple life style. A few sections later Marcus thanks Rusticus for a number of things, including introducing him to the works of Epictetus, and for treating with tolerance those who offend him by way of words or deeds. From Sextus, he learned tolerance of ignorant people and, basically, anger management, while Alexander taught him not to find fault in others. Notice how all of these have to do with the Stoic discipline of action, or “philanthropy,” the idea that a great part of human life is to get along with, and be helpful to, other human beings. Marcus devotes quite a bit of space to his adoptive father, the emperor Antoninus Pius. Among other things, because he demonstrated a readiness to listen to those who might have good suggestions, took care of his body without vanity but just so that he could keep doing what he thought was needed (i.e., sound mind in a sound body), which he did without regard for what other people thought of him. Finally, Marcus thanked the gods (or fate) for having given him plenty of good things in his life, including good parents, good teachers, and good friends. The overall impression one gets from Book I is of a humble man, despite his very powerful position, one who is ready to learn and earnestly tries to do his best in life to improve himself and help others. Perhaps not the ideal Sage, but not at all a bad role model, if you ask me. This entry was posted in Marcus on July 3, 2015 by Massimo. Good beginning Massimo. I too have not read the Meditations in quite some time. So, I will begin a read along with you. True enough, very few have had the life of Marcus. Though many today in our society have the opportunities of education, financial resources and experiences, by virtue of their being born here, to develop the same consciousness. How is this lost on so many who have so much? Marcus seemed to get early the ideal of,” to whom much is given, much is expected”.